Mike Rosenberg pens a scathing indictment of the Peninsula Corridor Joint Powers Board that runs Caltrain, calling out the board for rubber-stamping everything that is submitted to it by Caltrain staff (including, presumably, the MOU with high-speed rail). The number of Yes votes since the last dissenting vote: 1,591. With only 9 board members, that's 176 consecutive unanimous Yes votes! The CHSRA staff memo for the recent board meeting happens to tally the money currently allocated for HSR in California. 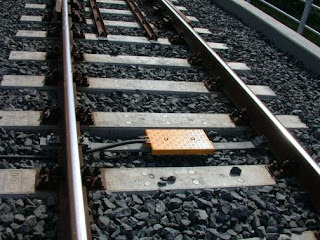 One of the items is $16 million of ARRA stimulus money, previously requested as an ear-mark for CBOSS, but now described as funding the "design/implementation of the first Positive Train Control/ERTMS interface implementation on the Peninsula." Say what? An optimist would note this is the first time that 'ERTMS' and 'Peninsula' are mentioned in the same sentence in official agency materials, rather than just a blog. That much is encouraging. A pessimist would note that "interface implementation" means an interface between the existing ERTMS and Caltrain's proposed CBOSS, assuming they would co-exist. This is the worst of both worlds: not only is CBOSS 100% functionally redundant with ERTMS, i.e. it will do the exact same thing that ERTMS already does, but interfaces between multiple complex safety-critical systems are astonishingly expensive to implement successfully. If CBOSS wasn't enough of a promise of years of delay and cost blowouts, then kludging ERTMS on top of CBOSS is an absolute guarantee. The high-speed rail project has very strongly implied that ERTMS would someday be installed on the peninsula. The recent train control technical memos (see TM-3.3.x) explicitly state that the selected technology must already exist as part of an operating system with proven experience worldwide on at least one high-speed passenger railway. That leaves exactly two solutions: (1) the ERTMS standard supported by the world's biggest names in train control, being deployed in dozens of countries worldwide, and (2) the Japanese Digital-ATC product by Hitachi, deployed in Japan and Taiwan. Wanna place bets? Show Some Teeth, For Once! One thing the Caltrain board of directors might consider sinking its teeth into (if it has any?) is the CBOSS fiasco-in-the-making. The correct answer, for a small fiscally-vulnerable operation like Caltrain, is to use tried and true solutions whenever they are available. When the wheel already exists (ERTMS) you don't take the risk of re-inventing the wheel (CBOSS), especially when HSR has already telegraphed its intent to deploy ERTMS and might even pay for it! At this point, a few wrong moves like CBOSS can quite literally end Caltrain's chances of survival. This 2.5-mile trench and covered tunnel facility would dive up to 60 feet below grade, passing below the Hillcrest Blvd underpass (itself passing under the at-grade tracks) and nearby storm drains, as well as under the Mills Creek to the south. It would also pass directly under the existing Millbrae station, requiring the excavation of an underground cut-and-cover "train box" as shown in the section drawing at right. If the cost estimates are to be believed, this one-track trench and tunnel facility would cost about $500 million more than at-grade tracks. 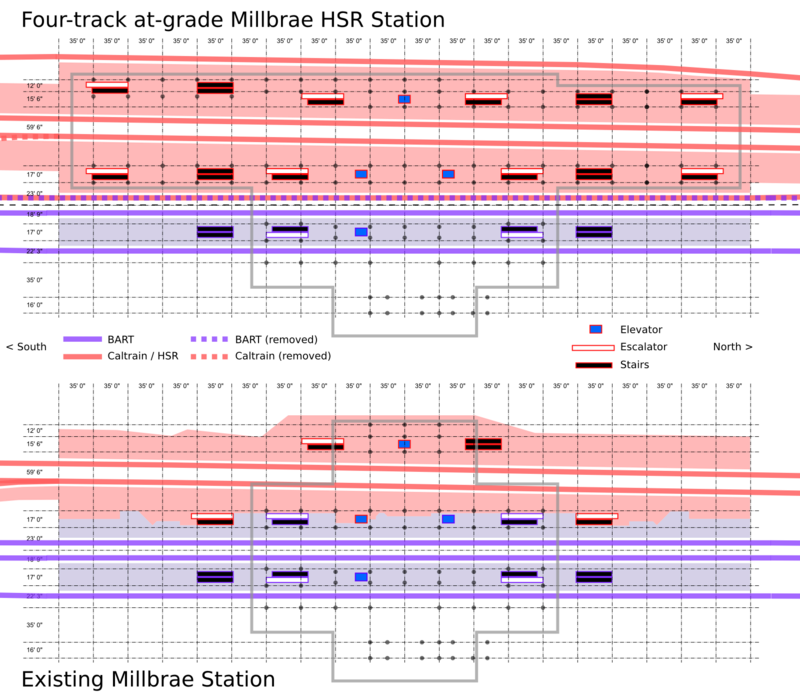 There may be legitimate reasons why a four-track at-grade arrangement can't fit in the existing Millbrae station. But are they half billion dollar reasons? For that kind of money, you'd imagine there would be some serious pencil-sharpening going on. One of the very first issues covered in these pages, way back in 2008, was the amazing lack of foresight embodied in the design of the Millbrae station. The structural grid of the station mezzanine was laid out so narrowly, and so far to the west of the sprawling BART facilities, that it now precludes four tracks from being built through the Caltrain side of the station without major impacts to the structure itself and to residential areas adjacent to the west. 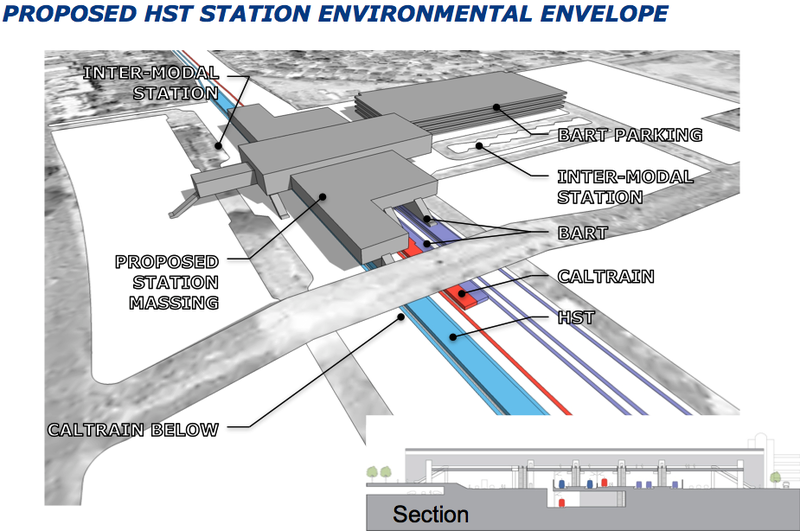 If the going-in assumption is that BART facilities cannot be impacted by HSR construction, no matter what the resulting cost, then we do indeed end up with the solution proposed by the CHSRA. But we live in a world where cost matters. Extensive, with cut-and-cover excavation below existing tracks and below foundations and support columns of existing mezzanine. Removes one BART platform track and one tail track, leaving two platform tracks and three tail tracks. This facility should be perfectly adequate, considering its similarity to other BART terminals at Pittsburg, Dublin/Pleasanton and Fremont. Portal of BART tunnel must be modified and additional reinforcement provided to support loads from adjacent track and freight trains. Forces Caltrain passengers to use additional vertical circulation to reach underground southbound platform track. Preserves northbound cross-platform transfer between Caltrain and BART, but removes at-grade Caltrain access from west side, where TOD is planned. 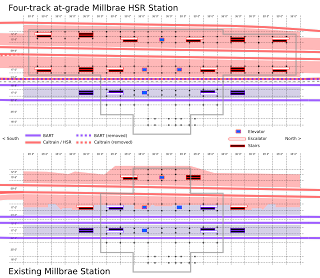 Removes northbound cross-platform access between Caltrain and BART, but creates two new bi-direction cross-platform transfers between Caltrain and HSR. Preserves Caltrain access from west side, where TOD is planned. Requires Caltrain and possibly freight trains to occupy a track immediately adjacent to BART trains, with no room for a traditional separation wall. Violates CPUC GO-26D side clearances. This could realistically be mitigated by passive and active safety measures, such as a thin but strong steel crash barrier and a permanent speed restriction on that track. This PTC-enforced speed restriction would be about 20 mph for freight and 40 mph for Caltrain, with no impact to Caltrain trip times since all trains stop at Millbrae. Additionally, sensors could be provided to detect shifted loads on freight trains before they pass through the Millbrae station. Minimal, although some expense in the tens of millions would be incurred for modifications to BART facilities. Yes, there are difficult design constraints. Yes, this proposed design violates a few engineering specifications and even some regulations. Yes, it will be politically challenging to infringe on BART. But when a half billion dollars hangs in the balance, it's time to work smarter and not harder. It would be reckless and irresponsible not to explore a compromise solution, through a carefully considered combination of design exceptions, regulatory waivers, and inter-agency agreements. Taxpayers should demand it. And if that doesn't work out, stop everything, tear down the whole station and start over from scratch with a proper track layout. The entire Millbrae Intermodal station complex, including 3,000 parking spaces, cost $75 million to build ten years ago. In today's dollars, it would be about $100 million, ONE FIFTH of the cost of the below-grade "solution". Last January, the grassroots group CARRD succeeded after a series of Public Records Requests in obtaining another release of key HSR technical memos that form the prescriptive framework for all the engineering design, statewide. The CHSRA probably doesn't like these memos being published because it undermines the effectiveness of the "Decide, Announce, Defend" model of mega-project engineering. This probably explains why these materials aren't, and probably won't ever be, published on the official CHSRA website... and that's precisely why they are posted here for all to see. The new collection of technical memos builds on the previous collection (also obtained by CARRD), fleshing out various new topics as well as filling in some detail that had been redacted from the old collection--such as some very informative surveys of foreign HSR best practices. Some memos known to have been published are still missing from the list, and CARRD continues their attempts to pry these free; they are grayed out in the table below, based on a comprehensive list of memos and drawings that was published in a July 2009 Program Summary Report on pp. 53-61. Peninsula stakeholders still eagerly await the release of Technical Memo 1.1.7, "Shared Use Corridor HST Criteria - Caltrain Corridor". Considering that the administrative draft of the peninsula EIR is 98% complete, there can be little doubt that this secretive memo already exists. These documents are guidelines authored by Parsons Brinckerhoff program management staff, ensuring that early designs for each section (performed by HNTB for San Francisco - San Jose) are consistent and compatible. They are not a "design bible" for detailed 100% engineering. The documents cover the entire state, which consists primarily of 220-mph very high speed, dedicated tracks. The peninsula is a different animal, with 125-mph top speeds in a shared corridor with Caltrain and freight trains, so use proper care when applying to or inferring conclusions about specific peninsula situations. The documents are a snapshot in time, as of December 2010. With that out of the way, here is the raw technical data download. For each memo, a brief summary of the content is provided.